Extreame Savings Item! 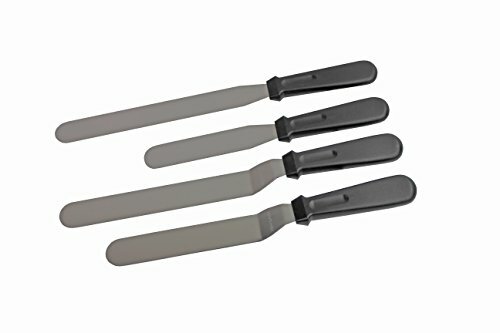 Save 46% on the Professional 4-Piece Set of Offset & Straight Stainless Steel Icing Spatulas - Perfect for Decorating Cakes, Pastries, Cupcakes - 7.5'' & 9.5'' Offset Spatulas, 6'' & 9.5'' Straight by Baking Aids by Baking Aids at Mint MD. MPN: sp1. Hurry! Limited time offer. Offer valid only while supplies last. How Professional Pastry Chefs Turn Icing Into An Art Form How do they do it? Why does their icing always look perfect? Their secrets: icing spatulas. How Professional Pastry Chefs Turn Icing Into An Art Form How do they do it? Why does their icing always look perfect? Their secrets: icing spatulas. These simple but useful tools make decorating a breeze while giving their goods that professional look. And you can get the same, simple tools the pros use here. ✓ Perfect for Any Decorating Job - Huge, multi layered wedding cakes or tiny mini cupcakes. Carrot cakes and meringue topped pies. This set gives you the tools to handle any decorating job. They're even great for serving pies and getting cookies off the baking sheet. ✓ Great for All Experience Levels - We designed these with the professional in mind, but that doesn't mean baking hobbyist can use these high quality spatulas to give their goods a professional touch. Even kids can use them, "...My daughter was so thrilled when she got these, and since she is 14.. it's hard to please her.. I am definitely happy I ordered these." - Jennifer Roberts ✓ What's in the Box - (1) 7.5" Offset Spatula, (1) 9.5" Offset Spatula, (1) 6" Straight Spatula, (1) 9.5" Straight Spatula. Everything you need to make your icing look professional. ✓ Satisfaction Guaranteed - We want you to be 100% satisfied. If you aren't happy with these spatulas, then let us know and we'll gladly refund your money. If you're ready to take your icing to the next level, Click Add To Cart now! HIGH QUALITY SPATULAS - Our aim is to have the best frosting tools on the market. This 4 piece set is just that. The blades are made from premium stainless steel and the ergonomic handles are designed for comfort. Whether you're a professional pastry chef in a busy kitchen or a weekend baking enthusiast, you'll benefit from having these tools. PROFESSIONAL FROSTING TOOLS - The offset spatulas keeps your fingers out of the icing and the straight spatulas are essential all round tools for any baker. Whether it's frosting a cupcake, a pastry, a pie, or the side of a cake, you can be sure these spatulas will spread the icing with ease. SAFE & SOUND - We value your health and safety, so we make sure that our spatulas are safe to use on food. We test our materials before manufacturing to make sure they comply with FDA regulations. You can be sure that our spatulas are made from 100% food grade materials that are FDA approved. EASY FROSTING - This set includes Offset Spatulas that are 7.5" and 9.5" long and Straight Spatulas that are 6" and 9.5" long. The long blades make covering your large products quick and easy and the shorter blades allow for precise icing in those tight spaces. The selection of sizes in this set makes decorating the largest pie to the smallest pastry a breeze. If you have any questions about this product by Baking Aids, contact us by completing and submitting the form below. If you are looking for a specif part number, please include it with your message.